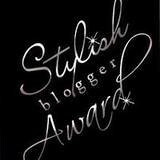 I am so honored that Teresa at Splendid Sass has given me the Stylish Blogger Award! I launched my blog only a few months ago and have been amazed by how many wonderful people I have come in contact with. Thank you so much, Teresa! It really means a lot to me. 1. I have always lived in Washington State, even though I don't like the rain. 2. My favorite movie is Cinema Paradiso. If you haven't seen it, put it on your list! 3. My family vacations in Cannon Beach, Oregon every summer. We love the beach! 4. I'm only second generation American. My grandparents were from Switzerland and Czechoslovakia. 5. Cooking is a huge passion of mine. 6. My favorite show currently on TV is Top Chef. I'm a Bravo junkie. 7. Lily Cler was my mom's dog who I adopted when she passed away last year. I adore having her! After receiving this award, pay it forward and follow the rules. 3. Award 10 great bloggers that you have recently discovered.